Boat Navigation Lights, the Rules. Do your navigation lights conform to the international standards? While the majority of leisure boaters rarely venture out at night, there will be occasions when you are late arriving in port. Enjoy safe night sailing and anchoring with the correct lights. Whatever your boating habits, the lights on your boat should be set up correctly, for your own as well as other boater’s safety. For the same safety reasons, those who enjoy anchoring for the night need to display a recognisable anchor light. Those "Ships that pass in the night, and speak each other in passing;” can only do so because they can see and recognize each other. Light rules for small boats. Making passage at night can be a wonderful and rewarding experience. One of my favorite times at sea is at dawn, as the horizon begins to harden (time to shoot those stars) and as the sky begins to lighten with the promise of another day. In days of old, sailing at night really did mean sailing in the dark. Today we are blessed with, sufficiently lit, navigation aids both on land and afloat to make night sailing as safe as possible. You are sufficiently versed in the art of navigation with or without GPS. You keep a good lookout. You are aware of how your depth of perception is affected by reduced visibility. Are aware that bright shore lights and reflections can be misleading, especially if you wear glasses. You are able to interpret the navigation lights you see on other vessels as well as on shore. And just as important, are confident that other vessels can see and correctly interpret your own boat’s navigation lights. Just in case you lose electric power, a light fails, your mast falls down or whatever, keep a set of battery operated LED navigation lights aboard. In order to keep adequate watch at night you need to protect your night vision by not exposing your eyesight to bright on board lights. Chart table and binnacle lights shout be kept as dim as possible. It is a fallacy that red chart table lights preserve night vision, the color is immaterial, it is the strength of the light that matters, a red light will only make reading the chart more difficult by altering your color perception. It is essential for you to see other boats and have them see you. It is also important not to reduce your night vision by using bright on board lights. Using your binoculars, believe it or not is an excellent way to bring distant lights into focus. My own philosophy when sailing my small boat at any time but especially at night is to err on the side of caution. Fishing boats a night call for vigilance, always give then a wide berth, stay well away from their aft ends to avoid the nets and never cut between two fishing bats as they may be pair trawling. Also be aware that they are constantly changing direction as they chase the fish. Larger, commercial traffic is more likely to be keeping a constant heading, so easier to avoid. Always take the avoiding action when approaching anything large, regardless of the rules of the road, it can take a large ship several miles to turn, while a small boat can turn and then resume it's course in yards. And besides, there is no guarantee that the other vessel has seen your navigation lights. 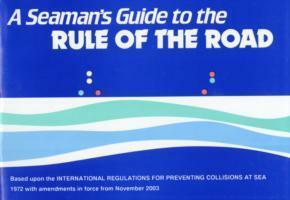 The International Regulations for Preventing Collisions at Sea (COLREGS) were designed to ensure the safety of every one afloat. They apply to all vessels using the seas and in all waters connected to the sea and which are navigable by seagoing vessels. Every one using these waters must know the rules and be aware of the correct action to take in the event of a close encounter. They also require that navigation lights are shown, between sunset and sunrise on all vessels operating in these waters. The ‘COLREGs’ lay down the standards for the day shapes and navigation lights which a vessel must display, in order to indicate its status to other vessels. These navigation lights are designed to indicate the size of the ship and the direction the ship is traveling. There are also standard light configurations to indicate whether a ship is at anchor, fishing, dredging, etc. which allow an approaching vessel to determine its approach. There are numerous publications available which, are designed with the pleasure craft skipper in mind, including notes and quick references to help him interpret and apply the rules. It is important to be aware that the COLREGs do not give any vessel "right of way" over another. It is up to the ‘stand on’ vessel to take action if the action of the ‘give way’ vessel alone is not sufficient to prevent a collision, or if the ‘give way’ vessel takes no action. This is particularly important for the helmsman of a small boat to remember, the other vessel may not have seen you. Boats under 7 meters / 23ft. Over 7 meters / 23ft. Over 12 meters / 39.4 ft. There are several general rules governing the type and positioning of navigation lights on all types of boat. Sidelights should be visible within an arc from dead ahead of the centreline through 112.5º. The stern-light should be visible through an arc of 135º, 67.5º either side of the fore and aft line. All ships at anchor must show an all-round white light. It has become common practice to use and all round masthead light as an anchor light. In my opinion this may be fine for a short mast but for a tall sailboat the light will be above the line of sight of an approaching vessel and on a clear night will be lost among the stars. Better to hang the anchor light from the fore rigging a meter or two above the deck. Sailboats under engine power should, according to the rules display the same navigation lights as power driven ships. A vessel under oar or paddles and sailboats or less than 7 metres / 23.0 ft must have an electric torch or lighted lantern showing a white light which can be shown in sufficient time to prevent collision. However they should if possible exhibit the same navigation lights as those for sailing vessels over 7 meters. A power-driven vessel of less than 7 meters / 23.0 ft with a maximum speed of less than 7 knots may display only an all-round white light. However, if practical, these should also show sidelights. Power-driven ships must should be displaying the red and green side lights plus white light that is visible from all around. On a vessel of less than 12 Meters the white light can be a combination of the (sectored) stern light and a (sectored forward facing) 'steaming light' or an all-round white light, the all-round and steaming lights must be higher than the side lights. Sailboats between 7 and 20 meters, while underway powered by her sails alone, must show either sidelights and stern light or a tri-color masthead lantern. The masthead navigation light and stern-light should be visible over 2 miles. Sidelights should be visible at least 1 mile away. All-round and a combination lights should be visible for 2 miles. Navigation Lights for Boats Over 12 meters / 39.4 ft.
A power-driven vessel of over 12 meters, while underway must display a white masthead/steaming light as well as sidelights and a stern-light. If over 50 meters / 164 ft length, then a second masthead light aft and higher than the forward one must also be carried. On vessels between 12 and 20 metres / 39 and 66 ft in length, the a masthead light, should be visible for 3 miles. Sidelights and stern light should be visible over 2 miles. For vessels of 50 meters / 164 ft the masthead light should be visible 6 nautical miles away and the sidelights and stern-light visible 3 miles away. It is important when sailing at night to be able to interpret the lights of other vessels in your vicinity so you can take appropriate action to avoid any danger. While the leisure boater should have on board one of the numerous publication which list and illustrate light signals for easy recognition there are some common ones which are worth remembering. Commercial fishing vessels should be given a wide berth. Trawlers, as well as normal stemming navigation lights should show a green over a white all-round light. If the nets extend for more than 150 meters horizontally from the vessel, there should also be an all-round white light to indicate the direction of the gear. When engaged in fishing other than trawling they should show a red over a white all-round light. Large vessels over 50 meters / 164 ft length will have forward all round light as well as a higher masthead light aft. A hovercraft will have an all-round flashing yellow light, as well as normal steaming lights. All ships engaged in underwater operations, such as dredging need to indicate that they are restricted in their ability to maneuver by showing a red over a white over a red light. They should also show a green over green light on the side where it is safe to pass and red over red on the side where there is an obstruction. A pilot vessel on duty will show a white light over red light.